Work in the fish hold is progressing pretty well. I've now got a first coat on the top section of the hold. Boy is the place looking dark suddenly. Thanks must go to Andy for all his help in the run up to Christmas. I'm looking forward to when the hold is all painted white. At the moment though, that looks a long way off yet. I'm still pretty much in holiday mode, so not much to report. Here you see a picture of my bilge line. This is the last bit between the filter box and the actual bilge pump. 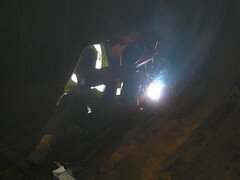 The work that has gone into just that small section of pipe! It's almost a work of art. It will look so much better once it's green. I write this while ensconced in the warmth and comfort of Lady Jane's wheelhouse, with a hot cuppa tea to hand. I can just see the sun setting through the rear window, giving the sky a warm, pink, glow which belies the cold outside (0C/32F). I suspect that blogging, like serious work on Lady Jane, will take a bit of a back seat until after Christmas. I'd like to take this opportunity to wish each and every one of you an extremely happy Christmas. I stumbled across the Metal Boat Society's website the other day, and promptly joined up in a fit of enthusiasm. Well worth a look if you've not done so already. I think that browsing through their forums is one of those delicious tasks, to be savoured in smallish doses. That is assuming, of course, that you like that kind of stuff. Rather like working your way through a box of particularly good chocolate over the holiday season. 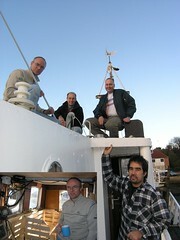 As well as plenty of info, their site also has links to all sorts of other interesting boat projects. I must say though, that their boats and projects seem substantially more up market than the likes of dear old Lady Jane. Ah well, one day she'll be up there with the best of them. I know I said I wasn't going to, but I've started painting what was the fish hold with that black bitumen paint. Here you see Fred and Malcolm hard at work at opposite ends of the hold splashing it on. I'd thought about it long and hard, and researched some other recommended paints (thanks Rob). The upshot is the advantages of the bitumen paint, price and effectiveness against rust, far outweigh the disadvantage of the place going so dark and dingy. The black paint has the unique effect of making the whole place feel so much smaller than it really is. Malcolm reckons it's like working in between those moving walls you get in the movies. I will eventually splash some white paint about, so as to brighten the place up, but wanted the solid undercoating of bitumen to prevent any rust getting through. Oh yes, and that bitumen paint gets everywhere... Sorry for returning Fred all blacked up Jenny. The job of sorting out the bilge filter box is progressing quite nicely, though a bit slow due to the weather we've been having recently. I'm going to make a start on painting the bilge line pipes next. 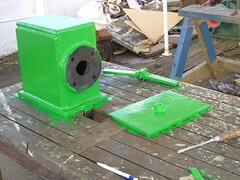 The box and pipes are painted green, to denote seawater. When I bought the green paint, it looked a slightly more modest hue than it now appears. I wonder how that blue paint I bought is going to turn out? I'm making good progress in the fish hold. 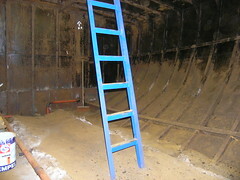 To give you an idea of the scale of this space, I've left a broom against the bulkhead. You can see it just to the left of the ladder in the picture. There is a bit more rust busting to do, some more scraping of old bitumen to do, some cutting of old steel left protruding overhead and, finally, a touch more welding. Probably some two to three days more work. With all of this done, and a good cleanup, I'll finally be ready to start painting the place. After all this time and effort, I'm so much looking forward to seeing this space painted out and looking good. Those of you reading this who have been on Lady Jane at some point will understand just how significant this picture is. For the first time in a long, long, time this particular deck is clear, and I can now get to both the wheelhouse and the engine room without having to step over boxes and tools etc. piled about. More importantly, things will be so much safer for visitors. I've not really had much choice, until now, as there has just not been the space available to keep everything handy. Now the steering room shelving is serviceable, I can finally stash things in some semblance of order. 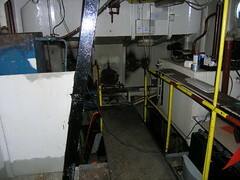 The way is now also clear for me to get going with cleaning and painting the top part of the engine room. I've almost finished the shelving in the steering room. All that remains is to fit the fiddles, which should be quick and easy to do, even though I've started to use the shelves already. It doesn't look it in the picture, but that's a huge amount of storage space there. Oh, and the shelves really are level. This will help the cleanup and painting the engine room project, as all the stuff which has been underfoot there for some time now should fit in there with room to spare. I've been blogging for two year now. Two years, who would have thought it? Work on making a serviceable console has now been completed, so that's another thing off the list and hopefully a happy enough skipper as a result. John? I'm pleased with the results, though I still need to decide if I should paint it, varnish it, or just leave the wood as it is. I like the wood effect, and will most likely just leave it. 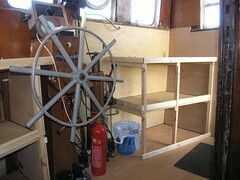 I had intended to install seating in the wheelhouse, but there is not really much room so I think I'll abandon that idea. As it is, sitting on the console, either side, is pretty comfy. I've started work on the compass installation, and have gone so far as to actually buy one. The problem is, it just doesn't want to point north. It's because of all the steel around affecting it, and nothing to do with Johnny Depp. To fit the compass properly I'll need to 'swing' it or, more likely, get someone in to swing it for me. Either way, it's obvious that this is not going to get done with Lady Jane sitting alongside in Fareham. Another task off the list, albeit abandoned. Saturday night was a pretty wet and windy night, all night, down on the boat in Fareham. Not the wild winds of biblical proportions you get elsewhere in the world, but a refined English wind of 60mph. Severe enough to blow down a few trees and to leave twigs on the roads - as reported on Sunday morning by Ocean FM, the local radio station I normally listen to. Anyway, the really great thing about being tucked up in bed on board a steel boat like Lady Jane is that the weather is not really a problem, asides of course for the sound of the wind in the mast's rigging and the banging of the exhaust flap. Finally, at about 3.30am, I got up and taped the exhaust flap shut after putting up with the noise for a while, expecting the wind to die down. Which it did not. My biggest worry was for the Christmas lights the wind spent the night trying to tear down, as I'd only just put them up that evening. No problem really, they were still twinkling away merrily the next morning. Essential work in the engine room is progressing steadily, and I'm pleased to say it's not all bad news. While we are on the subject of filter boxes, here is the bilge filter box. Ready for a first coat of paint. 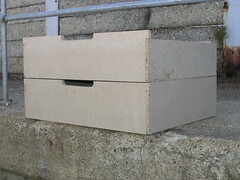 This box is in fairly good condition, despite the grim look which is the result of a coating of Rustroy rust converter. I suspect the reason for the marked difference between this and the port inlet filter box is that this box still had some annode left, bolted to the inside of the top lid, which must have afforded some level of protection from the salty water in the system. It is possible, that both this and the starboard filter box, which is also in pretty good shape, have been replaced at some point. A few coats of green paint on this filter box, and on the newly installed bilge pipes, will mark the start of the engine room cleanup operation, I'm starting here simply because it's an easy place to start. I've been having a hard time getting started with the engine room cleanup project, as I know it's going to be a long, filthy, job during which more pressing issues will no doubt reveal themselves to me. 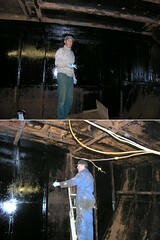 It's got to be done and I'm sure the end result, a clean and freshly painted engine room, will be well worth it. I doubt I'll ever be able to eat my dinner off the engine room floor though, unlike some engine rooms I've seen. 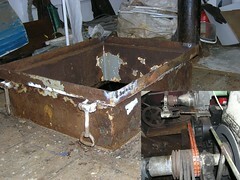 One of the items on my projects list is to repair a badly rusted seawater inlet filter box, and it's associated pipes. One each on the port and starboard side serve as inlets for seawater to cool the main engine. The other two inlets are for the, missing, freshwater maker and for seawater to use as a fire hose or deck wash via the bilge pump. Obviously each of these inlets has it's own valve (tap), which remains closed unless it's being used at the time. Both the main engine seawater inlets each have their own filter box, which filter out anything which may otherwise block the cooling system. These two systems are interconnected, so either one will do the job of providing seawater to cool the engine. The starboard inlet filter box, the one I normally use, is fine. The port filter box is a different story though. The reason I knew there was a problem was that I noticed the now familiar telltale sign of white crystals in amongst the rust, evidence of seeping seawater which has dried out, while cleaning down below. Anyhoo, Robin finally got around to extracting the troublesome box, in preparation to sorting it out, only to discover just how close I've been to a major flood in the engine room each time I've run the main engine. The ends of the pipes have been blanked off, but finishing this particular job properly will have to wait until I've got Lady Jane out of the water. Finally, thanks to Rob, I've now got the stern navigation lamp installed, and working correctly. This marks the completion of the back deck project, or will do when I buy the right bolts to secure it properly, and bolt it down a little better than at present. I know this bit has taken literally months to get around to doing, but it's been one of those small, but time consuming, jobs that I've just not done as there has always been other, higher priority, jobs to be getting on with. Obviously, now I need to get dear old Lady Jane ready for sea, this suddenly became a much higher priority job. I'm pleased to report that now all the navigation lights work just fine. Another key task off the list, and another step closer to going. Just how many people does it take to install an ariel? It turns out that the ariel, was as well as the radio, that was on Lady Jane when I bought her was defective. Here you see some of my climbing mates, Andy, Steve, Lee and Rob, all contributing to the process of installing the new ariel, which Andy is holding. I'm very grateful to Andy, who you can see basking in that afterglow of a job well done in the inset, for his dillegent work in testing, installing and setting up my new radio and ariel. Thanks must also go to Rob, who connected the on-board GPS to the radio. This enables the radio to give automatic positioning information, using Digital Selective Calling (DSC), in the event of a distress call. This crucial job has been done properly by Andy, who knows what he is doing and has the testing meters, tools and an impressive box full of odd wires and connectors to prove it. If it were me, I would simply have connected bits of wire and things until something worked - or the whole lot blew up. 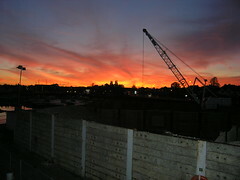 The end of another day in Fareham, marked by a brilliant sunset. I will miss Fareham once I've gone. I am, however, looking forward to being back on the River Itchen. The Itchen will mean such a big change as I'll once again be moored in the middle of a big river, and reliant on the rib (hbi), or baby Jane, to get to and from Lady Jane. There is so much more going on in the Itchen all the time though. 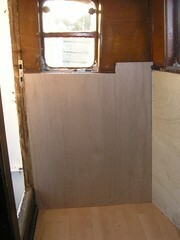 I've now got an extra four tonnes of ballast on board Lady Jane, not that much difference to the trim I'm afraid. 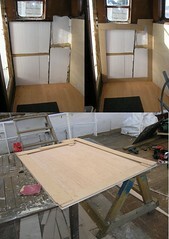 The photo montage gives you some idea of the effort that went into loading this stuff on board. Round the quay at low tide on my trolley, then shifting the lot on board once the tide was in, making loading a little easier. A difficult task made so much easier with the cheerful help of both Malcolm and Fred. I'm looking particularly dirty on account of I got to pack those cast iron lumps in down below decks. Apparently those, cast iron, bits of old railway you can see are called chairs, something I didn't know. You can imagine the confusion when I got a phone call from someone, who's name and company name I did not catch, announcing the imminent delivery of the chairs I'd ordered! The guy from emc in Southampton must have thought I was a bit retarded. We argued for a bit about whether I'd ordered any chairs or not and it was only when he mentioned they were to be delivered to Fareham that I finally twigged. All four tonnes is now on board, and most of it is stowed down below. After a full day and a half of it, I simply ran out of steam, Kit Kats can only keep me going for so long! That gazebo was a good idea. The trouble was it did not stand up to mother nature very well, despite the promises made by the guy on eBay. The first good wind did the sides in something horrible, to the extent that the side panels were unusuable on account of the big holes ripped in them. Over the last couple of months, the gazebo has slowly been deteriorating until it had reached the point where it was no use at all, and simply flapped in the wind like a load of abandoned washing. I've now had it re-covered by the guys from Solent Shrinkwrap (07917 408776), who did an extremely good job. This should last a good while I expect. 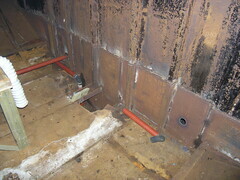 The job of installing the new bilge pipes has now been completed. This is really part of the fish hold bulkhead project. 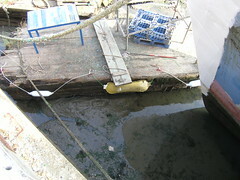 The picture shows the new (red) bilge lines to the forward hold and the the fish hold in the background, with a hole cut and a new length of pipe for the standby fish hold bilge pump in the foreground. 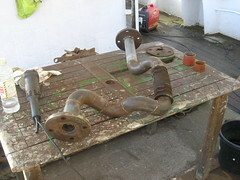 I've ended up replacing more piping than expected, but the old bilge pipes were quite severely wasted away by rust. That two inch piping is more expensive than I was expecting it to be. 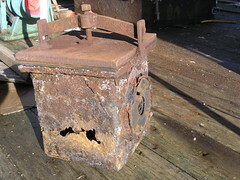 Although the bilge pipes have now been replaced, the bilge filter box needs cleaning up, and the piping still needs to be re-attached. 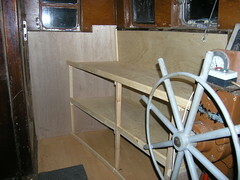 I'm very pleased with the progress of the wheelhouse console so far. Once the other side has been done, I can then start re-fitting such instrumentation, switches and lighting as I have - essential for the voyage round to the River Itchen. Fred has excelled himself with the templating of the actual work surfaces. Meanwhile, I've been quietly impressed by just how well the fiddles have turned out (the rails around the edges of the shelves for you land lubbers), the result of some measure of shaping using a router. I can well imagine just how effective a router would be in the hands of someone who really knew what they were doing. For now, I'm happy with a nice smooth curve on the tops of the fiddles, and a neatly cut step on the bottom, so they sit onto the actual work surface, making an overlapped joint. I know this is all temporary, kind of long term temporary probably, but it is so satisfying doing a job well. The best bit is that the console is a comfortable place to sit, with views out in all directions through the wheelhouse windows. With the heating on, cradling a big cuppa tea, it's perfect as a respite from working out in the bitter cold. Finally, we've got that first coat of blue on all the way round the bow section of Lady Jane, almost completing the first coat of blue on the starboard side. 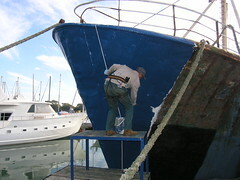 Here you see Fred, perched high above the water, putting the finishing touches to the bit he was working on. 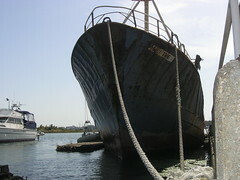 There is still a short section, at the stern, close to the waterline to be rust busted, primed and painted blue. Before I can do that I really desperately need to get a load of ballast in forward, so the boat is trimmed up more or less properly. I've found some ballast, so it's just a case of paying for it and having it delivered. It's going to be expensive though, at £188.00 (US$ 370) per tonne delivered, cash. Unfortunately that price includes VAT, which is unavoidable. I'm planning on putting in five tonnes of the stuff, then trimming the rest of the way with water, probably another five tonnes worth. Right now it's just too expensive for me to use only cast iron ballast, which would be my preference. The galley is starting to look a lot brighter. 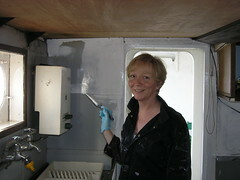 Here you see Pat, paintbrush in hand, in the process of giving the galley a makeover. The difference is remarkable, and I'm looking forward to the finished product. 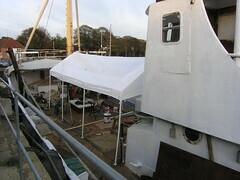 Work on the wheelhouse roof is very nearly complete . Here you see Fred standing, wondering if the sky is about to fall in on him, just before we finished screwing all the plywood pieces in. 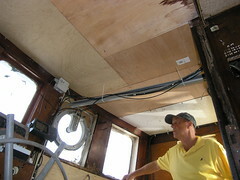 It has to be said that Fred was responsible for most of the plywood in the deckhead fitting together as well as it does. 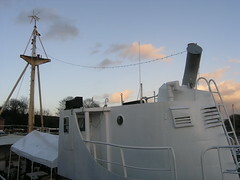 You can see evidence of the leak between the aluminium and steel sections of the wheelhouse roof at the top of the picture. I'll need to give sealing this another go, with bitumen paint this time. At some point it may be best to strip all the various sealing attempts over the years off, and start again. Not now though, too much to do elsewhere. I've still to cut thin melamine board to size and tack that to the deckhead which, along with hardwood battens over the seams, will really have the place looking smart. Of course, now Lady Jane has had a paint job all the way down to the water line, I need to put fenders onto the platform so all my good work does not get ruined. As usual, when it comes to the sizes of things on Lady Jane, the fenders looked fine in the chandlers, but once installed they looked too small. Ah well, they'll do for now. Besides fenders will always come in handy, no matter what size they are. I've been spending time sorting out the various drive belts (V belts) in Lady Jane's engine room. 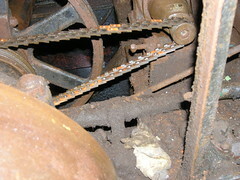 The main priority has been the fuel return drive belt, shown in the picture. 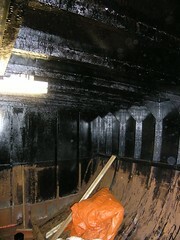 To explain, unused diesel from the main engine drains into a tank below decks. The return pump then pumps that fuel back into the day tank above the engine, ready to be cycled around again. For some (long) time, this pump has not been performing, and the fuel return tank is now full. This means that unused diesel has been spilling when the main engine runs. Not much I hasten to add, but nevertheless a nuisance and an unnecessary waste. I, with Robin's help at one point, checked all the piping to make sure there was no blockage, thinking that was the problem, when the answer was staring me in the face the whole time - the drive belts were really, really loose. It sounds dumb, I know, but it took replacing the belts on my 240 volt alternator to realise the V belts on the fuel return pump were the same type and that I now know how to fit them. The new V belts came with a natty tool and, more importantly, instructions on how a belt should be tensioned correctly. It looks easy in the picture, however I can promise you that messing about with these belts is not so straightforward. The main problem being I have no bar to get the leverage necessary to turn the main engine over with human power alone, so I need to use the compressor to raise enough pressure to turn the engine using the air start system. Fitting a belt needs two people, or lots of ingenuity, plus plenty of compressed air for those frustrating times when the belt slips on the pulley AGAIN and the whole process has to be re-started. With the fuel return pump belts done, the return tank should now get drained and, as a bonus, I have the luxury of not needing to manually pump diesel into the day tank from the main fuel tanks. I've also tightened the fresh water cooling pump belts, you could previously turn the pump by hand under the belts, so this will ensure the engine now runs a little cooler. By the time I was done the tide was well on it's way out, so unfortunately I could not run the engine to ensure all was well after the belts had been re-fitted. I still need to address myself to the seawater pump V belts, which are not nearly as bad as the others were, but this will have to wait until I get back down there with sufficient enthusiasm for another bout of dirty, frustrating, work below the engine room deck. Right now I'm thinking "If it ain't broke, don't fix it", or is that just boat lassitude? This entry is about the templating technique I was shown by Alan, from one of the boats in the little marina next door to Lady Jane. What happened was, I had cut one of the large pieces of ply for the second last shelf in the steering room and got it completely wrong. An expensive mistake, as those big boards of ply are expensive and, once cut, are hard to re-use because of their shape. Anyway after hearing of my problems, Alan, who was on board for some other reason, tried explaining templating to me. Eventually we had to go across to his boat so he could show me how it was done. Buy a board of cheap, easy to work, material - I'm using 4mm MDF, and some screws to hold them together. Cut strips of board some 75-50mm wide. The width and length ultimately depends on the size of the boards you will eventually cut. If you are cutting curves, you may need to cut thicker lengths to accommodate the curve. Cut the strips to the lengths around the edges of the final shape to cut. Where you are cutting a curve or a difficult shape - find a narrow length of offcut, drill a hole, or holes, through which a pencil will go. Trace the curve on one of the strips held against the chord of the curve, holding one end of the offcut at 90 degrees against the edge of the curve while your pencil, through the hole on the other end, traces that curve onto the strip. Join all the cut pieces with screws, such that the finished outline exactly matches the final shape you need to cut. I find it helps to temporarily screw the strips to the edges of where I'm cutting the board for, then join the pieces on to one-another. Take care so that you can unscrew the whole template without having to dismantle it. Make as many templates as you need before arranging them on your piece of board to cut, so as to get the most possible use out of the board (pay attention to the side of board which will face outward). Cut the board and enjoy the satisfaction of a series of perfect fitting pieces (nearly) every time. Dismantle the templates pieces so you can re-use the strips and screws elsewhere. This has been so useful for me, I thought I'd pass it on. It has also to be said that Fred has taken to this like a duck to water. If you have a better technique, or find success with this one, I'd love to hear from you. 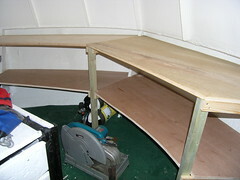 This time it's the plywood skin in the wheelhouse. 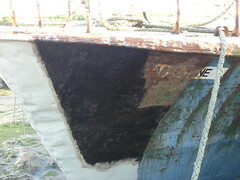 This was originally ripped out in preparation for sorting out the holes rusted through the wheelhouse sides and floor. In the event, sorting out those holes turned out to be a much, much, bigger job than planned. With winter coming last year I chose to re-insulate the place, as it was the only place fit to sleep in while I was on board. The holes in the steel would have to be addressed later, when I had someplace else on the boat to sleep. 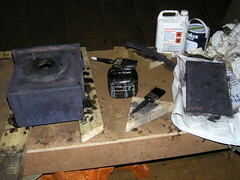 I had at least got rid of all the stinky wood, and had largely cleaned up the rust though. Somehow, the plywood skin never got done - It just did not seem necessary to do as it would all have to come back out again anyway. Now though, I need to have the instruments etc. mounted securely, so the panels have to go in as preparation for building a new console, even though it will only be temporary. The plywood skin is more work than it looks, and uses plenty of material as well. I've been using a templating technique shown to me by Alan, from one of the boats across the way. I'll do a separate blog entry on templating, as it's an invaluable method of ensuring complex wood shapes are cut right every time. This is one entry which is sure to bring a wry smile to at least one of Lady Jane's former owners. I have at last got around to doing a proper job on fixing the wheelhouse roof leak which has plagued me for the last two years. 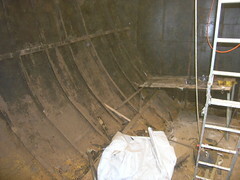 The picture shows the newly cut and bolted section of steel plate over the hole where the compass binnacle used to sit. You can see the hole I've covered in the bottom right of the picture, taken just after I'd taken off the cracked plastic cover. This patch will do until the wheelhouse gets refurbished, as the section I've covered is aluminium and, although I've a rubber seal between the plate and the aluminium of the top of the wheelhouse, the bolts are likely to have galvanic corrosion issues. I'll also be willing to bet that John, the skipper who will take Lady Jane back round to the River Itchen, will thank me for preventing a steady trickle of water down the back of his neck. 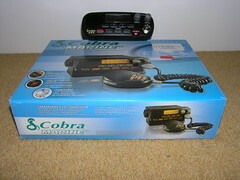 One of the things on my recently updated list is to install a VHF radio. Simple enough you might think, just a case of going down to the chandlery and buying one, replacing the old brackets with new, plug everything in then - voila. After all, there had been a radio in there before. Not so simple, not by a long shot. The 'going down to the chandlery and buying one' was the easy bit, well maybe not so easy on the credit card. When I got back to Lady Jane with my new toy I quickly realised that the coax cable which connects the radio to the ariel was cut on the wheelhouse roof, while the cable from the ariel to the radio was cut somewhere behind where the radio was fitted. Hmm, problem number one - I needed some coax cable, and probably a new connector, but the chandlery was now shut. Nothing to do now but read the instructions. Problem number two. The ariel is not really situated a safe distance from where people will be - a distance of 3 metres is recommended (this may have to do for now though). Closely followed by problems number three and four. I need a ships radio licence and I personally need a radio operators licence. I've not gone there yet, and might not for now, but I suspect connecting the radio to the mangy old GPS I have on board will present it's own set of problems. So far I've applied for a ships radio licence - at least that's free! I'm so nearly there with the primer on the forward part of the starboard side. Just one more coat should do it, then I'll slap on the rest of the first coat of blue. 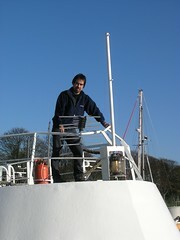 I really need to get that ballast in soon, so I can finish rust busting, priming and painting at the stern. I won't get a proper waterline painted until I can get her out of the water, but at least it's an improvement on what I have now. This is a picture I snapped at the village where I collected my anchor winch from. 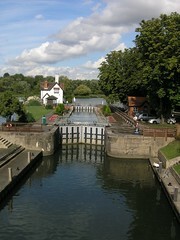 It's on the Thames, between Oxford and Reading someplace, though I can't remember the name offhand. I've been meaning to blog about it for a while now. Anyway, I'll have to go back to the place sometime soon, when the weather is good, as the place is so photogenic. There are a few places I've seen there that I really want to photograph, but was a bit pressed for time when I was last there. Also, there is at least one place I've seen which looks likely for a good Sunday lunch. Maybe once Lady Jane has been moved to the Itchen and I have the time for a bit of a break. The picture you can see here is the new ladder down into what was the fish hold. It doesn't look too much from this angle, but it's just over 3 metres (9ft) long. Half the length of a new piece of angle iron. I chose to make it out of angle iron so it will be sturdy, unlike it's predecessor. It's so well built that it's likely to outlast the hatchway its welded to. There is no doubt in my mind that, for safety's sake, replacing the old aluminium ladder you can see alongside the new one is a good move. I'm also betting that at least one set of former owners would smile to read that this ladder has finally been replaced, as it was inherited when I bought Lady Jane and was rickety then. Anyway, that's one more thing off the list. Ok, I've been working on the items on my list. Because the weather has been pretty foul, I've been working on cleaning up in the fish hold. I was merrily rust busting away, and had just attacked a piece of rust I'd seen in a corner when suddenly I had water squirting in from a hole I'd punched through the hull below the waterline. I found some wood and jammed it in as best as I could, then phoned Robin. When Robin could finally understand what I was saying through my babble, he said "I'll be right down". I calmed down a bit, found a better piece of wood and hammered it into the hole. The water coming in stopped completely, allowing me to regain my composure somewhat. This happened in a place I was convinced the steel was all good, so it had me really worried. Needless to say, the rest of the day was a bit of a write off as attention was diverted to the hole in the hull. I spent some time thinking about it and carefully examined the rest of the hull, while waiting for the tide to go out so Robin could weld safely with Lady Jane settled into the mud. I worked out that the hole was where wood was laid against the hull, which would have been wet against the hull for goodness knows how long. Ideal conditions for corrosion. I looked at other, similar, spots and, unsurprisingly, found three other places where the steel was rusted right through. I suspect there are more, but Robin wanted to get away for his tea! It is important to make clear that these patches, although serious, are very small and relatively easy to fix completely. Once all the suspect patches have been cleaned out and repaired, the integrity of the hull will once again be as sound as was expected. In a really bizarre coincidence, I'm 99% certain that I was rust busting on the exact same panel when the leak in the fuel tank happened. 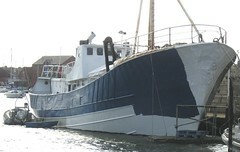 It's amazing to me that Lady Jane has been afloat all this time, with holes effectively stopped with rust. The really scary thing is that these patches could so easily have been missed in the rush to get Lady Jane ready for her voyage round to the Itchen. 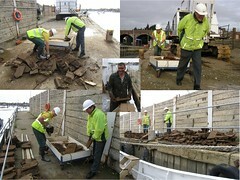 My sojourn at the Lafarge yard at Fareham is almost at an end. I've been given notice that I must move on. My initial reaction was one of surprise and disappointment at loosing what has been a tremendous place to keep lady Jane. I will truly miss Fareham, as the place has been good to me for all sorts of reasons. On the positive side, I'm reminded that I've got a big ol boat that can go anywhere, so there is no reason for me to stay alongside forever. This is probably just the prompting I need as a gateway to more exploration and adventures with Lady Jane. My thinking being that if I can travel with her, why shouldn't I? In reality, for now, I'll take Lady Jane back round to my own mooring on the River Itchen in Southampton. 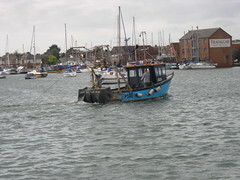 I spoke to John, the skipper who originally brought her round from the Itchen, and he's up for taking her out for a spin again. Obviously my priorities have changed, as I've now got to scramble to get the engineering stuff done so she will be fit for the high seas. No dates have been set as yet, but my focus is on being safe to travel and, of course, Lady Jane has to look good before she goes anywhere. It's not that I've abandoned you or anything. It's just that I've been busy on Lady Jane, and internet access is patchy at best. I'll do a proper post on Monday, when I'll have plenty to say, promise. It's coming up to autumn now, so boat activity on the creek is diminishing. 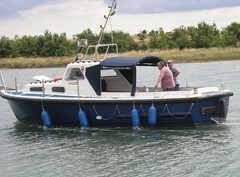 Here you see Cassie, a tidy looking boat, who's fenders have been taken out for a wash by the owners. I'm occasionally envious of boats like Cassie. It must take no time at all to paint her. Cassie could not make it to places like Labrador though. I've been away in Ireland for the last couple of days - hence the silence on my blog. 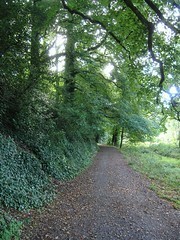 To see a few more choice pictures of Ireland, follow this Flickr link. It's been a very welcome couple of days break, and a long time since I've done something other than being on Lady Jane. I'll have to take Lady Jane over and stay for a while at some point. Here is the finished, insulated, product for this part of the deckhead. I've still got to insulate the section of deckhead which lies beneath the galley, but this is waiting on the galley underfloor heating project. What I've done is to cut and fit the Celotex boards, then I've filled in all the gaps and joints with two part polyurethane spray foam insulation. In effect, getting the best of both worlds. I get the value of the insulating boards, which I think is less expensive per square metre than the spray foam, and the value of thorough insulation with any gaps well filled with the spray foam. There is absolutely no doubt in my mind that spray insulation is so much quicker and easier than cutting and fitting all of those boards. 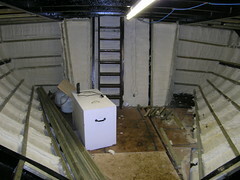 So far as the boat is concerned, I believe the combination of Celotex and the spray foam insulation will prevent any condensation issues, as all of the steel, so far as is practical, is now covered with insulating material and I'm confident that moisture simply will not be able to penetrate through to the underlying steel and cause rust issues. I also have the benefit of being able to remove the insulation relatively easily, in the event I need to get to the steel behind it all. Only time will tell if this all went according to plan. 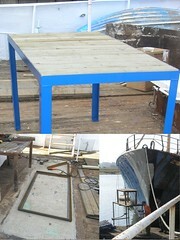 I've temporarily halted other projects in order to make a new table, which you can see in the top part of the picture. The reason for the new table is evident in the wobbly legs you can see on the old table in the bottom right picture. The old table is perched on top of my workbench, which is in turn sat on the platform I have floating alongside Lady Jane. The old table's legs have been getting increasingly unsteady over the last few months, making the whole thing a little precarious. I blame the circular saw, as it's made a few unauthorised cuts in the table top when cutting wood for other projects, substantially reducing the table's overall integrity. When I've been standing on my table, on top of everything else, to chip or paint at the top of the bow section, people have been taking pictures with their camera phones etc. No doubt I'm on someone's blog somewhere, as yet another example of why women live longer. There have also been a few comments from the folk at the marina across from me. Anyhoo, I generally use a climbing harness and safety rope when working up there, especially after the legs have got so wobbly, so I don't consider the arrangement unsafe. Recently though, even after a stern talking to, liberal application of wood glue and a general tightening up of all the screws in sight, the tables legs are showing an increasing tendency to point in all the wrong directions with no prior warning. In the event the legs give in completely while I'm working up there, it's not so much the indignity, or discomfort, of a fall that concerns me, but the possibility of loosing power tools to the mud that has spurred me into action. That new table takes me from one extreme to the other. It's made of 50*50*5mm (2*2 inch * quite thick) angle iron, which I bought in preparation for building a new ladder, and lengths of 50*100mm (2*4 inch) wooden slats. Nuclear bomb proof springs to mind. Overkill I know, but those are the materials I had to hand. Ha ha, it would be ironic if the platform sank because the new table is so heavy, and I lost my tools anyway. 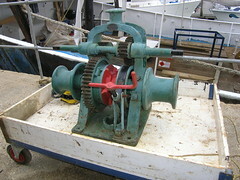 Earlier last week Seb, from over at Wendy Ann 2, sent me a link to an eBay auction for a much needed anchor winch. I had to nip over to Fred's place on Saturday afternoon, to get front row seats for the end of the auction. I favour last minute bidding, in the hopes of lulling any other bidders into a false sense of security. In the event, it needed some swift work on the keyboard to ensure I won it. A little more pricey than I was expecting, I must say. The picture shows my new winch, sitting on the trolley, just before lifting it onto Lady Jane. Thanks to John, the seller, for all the help loading it into the truck (no easy task). Thanks are also due to Fred and Duncan who helped hoist it onto Lady Jane. Mostly, though, thanks to Seb for bringing it to my attention in the first place. Next, I'll need some chain - lots of it. Mine is not the only trawler in the creek! I don't know why it should, but it comes as a bit of a surprise to see a boat trawling this far up Fareham creek. It looks, or more accurately sounds, like they are after the shellfish which must lie in the channel. I always thought the mud didn't have any mussels or anything like that in it, but they must be out there, where the water never leaves - even at low tide. A lone fisherman over the other side of the creek was shouting and waving his fist at the trawler, presumably because they had broken his line. Why he didn't simply reel in beforehand is somewhat of a mystery to me. Well goodbye to her name on the hull at least. While chipping rust on this section, I got that Elton John song in my mind. You know the one. Ok, I know it's Norma Jean, and not Lady Jane, but there's not that much to think about when chipping. Anyway, that song stuck in my mind for quite some time, so I thought I'd pass it on. Not much more to say really. 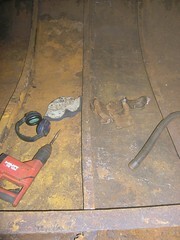 I've finally got my act together and sorted out my power issues, so I can at last weld on board. Originally, in December 2004, Lady Jane was moved to Fareham so Robin could use shore power to do some desperately needed welding jobs, as Lady Jane could not produce the power for herself. In March 2005, I fitted a 16Kva alternator to the donkey engine. For some reason the alternator was not capable of producing enough power to weld, though it would power pretty much anything else I needed. It is true that the donkey engine is in need of an overhaul, but still that was a pretty disappointing experience. In May 2006 I then tried buying a new 7Kva generator - this was a complete debacle, as it turned out that I ended up with a cheap Chinese made generator, an imitation of the genuine item, which was made from inferior materials and did not last. The crank case itself cracked, the last in a long list of issues I'd had with it. Fortunately Ecotrax, the company who sold me the generator, kindly refunded my money. Last week, I got around to having another look at the alternator on the donkey, as part of a renewed effort to weld using the boat's own power, because shore power is not an option available to me. Initially I tried using some proper 6mm electric cable between the alternator and a newly fitted 13amp socket. I had previously used an extension lead that was lying around, so the suspicion was this was insufficient for the current the welder was drawing. Anyway that didn't work. Ok, I know I really need a distribution board, properly fitted instead of the 13amp socket, but I'm waiting for my dad to help me with that! Next, I replaced the drive belt with a different type, and this time used two belts. Ta da... I could weld using the donkey and alternator at last. I'm not sure how to go about getting the most out of my 16Kva 3 phase alternator, or even how to test that it's capable of producing the power it's supposed to, but for now I'm happy that it's now producing the power I need to weld. The picture shows the first welding job I've done on board, my previous welding jobs were done at home, with an inset showing the new alternator drive belts. I still need a modern, silent, diesel generator though. That donkey is pretty noisy when you are inside. A relatively small amount of work, but a big milestone achieved. A corner turned you could say. As you can see, I've had a bit of a blitz on the remainder of the rust on the starboard side, down at the waterline and at the remainder of the bow section. Yuk, that mud - some of which you can see spattered up the hull in the picture. How long ago did I say I didn't have much left to do? Now, asides for a tiny section which I could not get back to with the wire brush because of the weather and tides, all that you can see of the hull is a rust free zone - right down to the waterline. 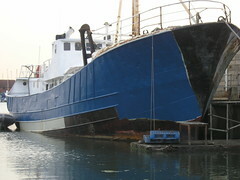 I know I also have a stretch of rust busting to do at the waterline towards the stern, hopefully only a day or so's work. With that done, finally, all the rust will be completely gone from the hull on Lady Jane's starboard side - for now at least. 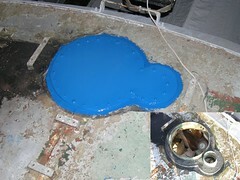 It's now a case of getting that primer on as quickly as possible, then finishing that first coat of blue paint. A second coat of blue paint over the whole lot will then complete the job, and I'll be ready to turn Lady Jane around to make a start on her port side. We've just had the biggest tides of the year, at slightly over five metres. Lady Jane looks most impressive, towering over the quay on such a big tide. Obvious really, but there you go. Seeing Lady Jane like this reminds me, again, that I've got to get over the side and finish rust busting on the starboard side while the weather and tides are good. Once that's done, I can then finish with the blue paint on that side. It would be good to have that all finished, with winter not far off. Too much to do, and not enough time to do it all. 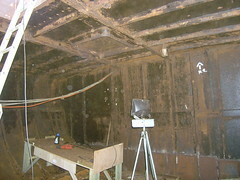 I've made a start insulating the deckhead (ceiling) of the stern accommodation. I'm using Celotex boards in the overhead space, rather than the spray foam I've used elsewhere, because it's very likely that I'll need to access this steel again - as part of the galley refurbishment project which is on the horizon. 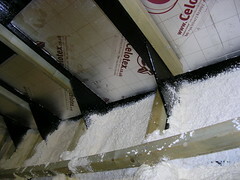 The spray foam is a pretty permanent solution, as it will not come off too easily, so Celotex seems the best option here. Cutting and fitting the Celotex has proved to be a tedious task, as each section has to be measured, the board cut on deck then brought down below, because the uncut Celotex boards are too big to fit through the hatchway. What I'll do is spray any gaps between the steel and the Celotex with spray foam insulation, so as to fill the voids which would otherwise be impractical to fill. 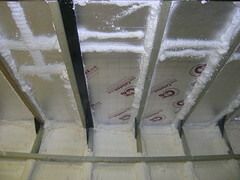 This will ensure that all the steelwork is adequately insulated. Spraying that foam insulation is, unquestionably, so much faster and easier. It's time for me to make a proper ladder to access to the fish hold, as I'm going in and out of there more and more. In the right of the picture, you can see the folding aluminium ladder I have been using. This was on the boat when I bought it and has simply been used like that ever since. It also gets used to climb down the outside of Lady Jane, onto the platform, from time to time. Right now the ladder is simply propped there, with no support or fixings of any kind to keep it in place, obviously not too safe a state of affairs. While I'm fine with using the ladder for myself, I'm very concious of the safety of other people using it, and I'm also aware of the potential for an accident when I'm tired, or not concentrating. The bottom of the hold is about three metres (9 ft) below the deck, so any fall is likely to be troublesome, especially if I'm on the boat alone. I think some lengths of angle iron, with angle iron steps should do it. 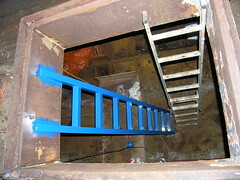 I can then weld the top of the ladder to the hatch entrance, and pin the bottom to the concrete in the hold using Hilti nails. While I'm on the subject, it had occurred to me that the open hatchway is a big space just above deck level, and one which can be fallen through very easily. I should also make up some kind of safety grill to go into the hatchway. One that people could climb through easily enough, so it could always stay in place unless anything bulky needed lifting or lowering. Here's the routine with the Hilti TE104, the best tool I've found for rust busting so far, though I prefer using a chisel point, rather than the needle gun attachment for this type of work. Put on ear defenders, goggles and gloves (the hat was for artistic effect). Work at the rust until I can't see anything through the misted up goggles. Clear out the flakes of rust. Put on ear defenders, goggles and gloves. Clear out the flakes of rust. When the tin is full I get a break. Vacuum the place I've been working on to make sure I've got everything. The filter on the vacuum is hopeless with the fine dust, so I have a vent pipe to the outside attached. This helps keep the rust dust down to levels such that a mask is not really needed. The right hand panel is pretty much done, as you can see. An hour later, the panel on the left was looking pretty much the same as the one on the right. Physically demanding work, and needless to say - very noisy, but it's got to be done. Sometimes my mouth is bigger than my brain! In a fit of enthusiasm, I said it would only take me a few minutes to knock something together, rather than endure a visit to a certain well known Swedish furniture store. Here you see the first drawers I've ever made in my life - the first of eight, and part of a bigger creation which is intended as cheap, temporary storage. Needless to say, it's harder than it looks to make furniture - especially drawers! At least I got to play with a new tool, a router, to cut the slots for the bottoms to go into. Though I feel I've yet to realise the router's full potential. My justification for all this effort is that I need to work out how to do this sort of thing anyway, as I've my eye on the steps after the insulation, the underfloor heating, the plywood skin, the new boiler and associated systems etc. Anyway, I've an idea on how not to do the bunks, and a better idea on how I'll do my next set of drawers. I'll also need to work on mastering those tricky blind dovetail joints (need to get my head around creating a jig of some sorts). Maybe I'll just buy the tough things like drawers from that place and cut them to fit Lady Jane instead. 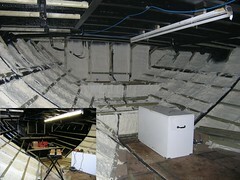 I've finally got the rest of the battens in, and have almost got a complete layer of spray foam insulation in. By almost, I mean I have a small patch a few metres square under the thin plywood decking not insulated - hardly important I know. The inset in the picture gives a snapshot of the place just before I finished the last of the battens, and before starting to spray with foam insulation. Despite being effectively finished, I've decided to order some more spray foam insulation from Chantel. This will mean I get to finish insulating below the floor, and put another layer in throughout. My thinking is that it was so quick and easy to spray the insulation, so while everything is still accessible, I may as well reap the added benefit of a few more hours of spraying and get an additional layer of insulation in. The more the insulation the less the longer term fuel costs, so I have no doubt it will pay for itself pretty fast. I'll also know that it's been a job well done. Somedays there is lots of progress, sometimes very little. Right now there is no progress at all. I've been busy on other, important, things. Come the weekend, things will pick up again. Promise. I'm sure I've said it before, but the spray foam insulation has made an almost unbelievable difference down below. Now its like working inside a giant cream cake, rather than the grim black hole I'd become used to. The remarkable difference in ambient light has given me pause for thought. Right now I'm leaning towards using the light grey primer in the area that was the fish hold, rather than the bitumen paint I used in the aft accommodation space. I've not made a final decision, but the pros seem to outweigh the cons, particularly as the fish hold space will most likely take far longer to get to the stage I'm now at with the aft accommodation space. It doesn't look like I've done much, but I've made pretty good progress in what used to be the fish hold. This grim sight will soon be just a memory, and maybe a few blog entries. It's such a huge space down there, there is no other way to do it than get my head down, and get on with it. What I find works it to set a target, say to achieve before a tea break, then section that off into manageable bites, and work at it a bite at a time. What is for sure, I got my money's worth out of one of my noisy weekday days. Ear defenders are very much needed when using that Hilti breaker with a needle gun attachment. One of the crucial elements of applying the spray foam insulation correctly is the temperature, with 27 degrees apparently being the optimum. My idea was to build a box which I could use to heat, and keep heated, the spray foam insulation cylinders, without having to overstretch my poor little generator if I could avoid it. I was pleasantly surprised at how well the heating chamber worked out. Soon it will get pressed into service as a coolbox, it was over-engineered for just that purpose. In the event, the generator did not have to work nearly as hard as I thought it would, and the cylinders themselves stayed at the required temperature for far longer than I thought they would before the fan heater kicked in to top up the temperature again. 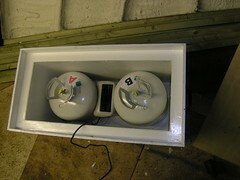 The picture shows the spray foam insulation cylinders nestled in the heating chamber, with a cheap fan heater slotted in between them. I monitored the temperature of the chamber by using a remote temperature sensor, which I got with Lady Jane when I bought her, as obviously having the cylinders heat up too much would have been a little troublesome!